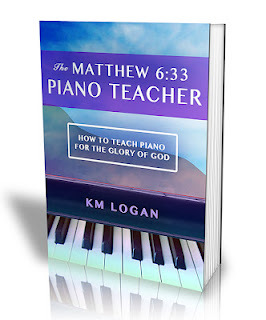 If you have ever thought about making an income while honoring God through piano lessons, K. M. Logan has written a book just for you. “The Matthew 6:33 Piano Teacher" is an e-book written in such a way that even a high school student could pick it up and learn how to teach piano lessons with it. I am not a piano player. However, I was asked by the author to look over her new book and give my thoughts. From what I saw, “The Matthew 6:33 Piano Teacher” is a unique book in content, and well worth the cost of $9.99. It includes questions and answers about qualifications needed to teach piano, how God can bless your teaching, the advantages and disadvantages of teaching, the numerous business aspects of it, how to set up your piano studio, what policies to have in place, and additional resources. If I were interested in teaching piano, this would be an informative tool to have on hand. For more information, or to place an order, go to http://www.633music.net/. The book can also be purchased through Amazon.com, or barnesandnoble.com.